Mined, forged, machined, tempered, ground and assembled in the USA. It can be difficult to find products made domestically by 100% American-owned companies. Silverthin thin section bearings stand alone among competitors in this regard. Silverthin is a small manufacturer located in Preston, WA, about 30 minutes east of Seattle. This picturesque location serves as the hub of Silverthin’s manufacturing and sales operation. Management, purchasing, planning, quality, and operations are located in Preston, with some manufacturing processes and sales management located in California and Illinois. Silverthin Bearings manufacturing equals strength and flexibility without sacrificing reliability. From raw material to a completed solution in your application, the Silverthin manufacturing team prides itself in delivering the right product and service every time. Quality Made-in-the-USA raw material at the source of Silverthin’s supply chain is the beginning of the product’s strength. Rings and tube stock from the Midwest, balls from the Northeast and retainers from the Southeast, Silverthin stands out now more than ever as a domestically owned, domestically sourced, “Made in the USA” solution provider. Reliability and flexibility are built into Silverthin’s thin section bearings from the very start. Blanking, hard turn, grinding and heat treat all take place at facilities in California and Washington. 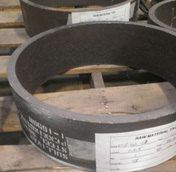 In many cases, a forging or semi-finished ring can be used to make various types of bearings to meet customers applications. Silverthin’s inventory of components stocked in Preston, WA allows it to deliver custom solutions in a fraction of the lead time of its competitors. The assembly process starts with pairing of an inner and outer ring. A retainer is selected and balls are matched to a set of rings depending on the bearing’s intended radial play. Depending on requirements, additional inspection or testing may be performed by Silverthin’s quality team. All parts are hand-assembled so small runs, quick turn-around, and flexibility are the primary commonalities of Silverthin’s products and services. Finishing touches such as laser etching, washing, and lubrication deliver further customization for specific customers and applications. An ISO class 6 clean room at the Silverthin headquarters provides washed, lubricated, and packaged product for the most demanding semiconductor, medical, and defense applications. Finally, Silverthin’s assembled thin section bearing solutions are shipped to our network of authorized distributors and major OEMs in the United States and around the world.